Strangely enough the book starts out with a pretty thorough overview of HTML 5 and CSS. For existing web developers who are interested in learning how to use their skills for developing Windows Store apps this probably won't be of much use, but I still think it's a welcome addition to the book. It certainly made it easier for me to follow the remaining chapters and I'm sure it will for other readers with similar (lack of) skills as well. 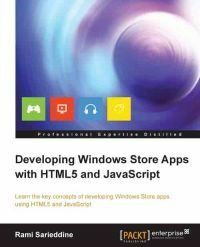 The rest of the book focuses on Windows Store app development, as expected. Having already gone through the process of learning it, I can say that in spite of its shortness, it manages to cover all the important topics. The reader should definitely be able to write and publish his own first application, once he's done with it. More importantly, it provides a good basis for further learning about the topic which I would certainly recommend.